Second hand and used Kitchen Furniture for sale. All of the top items on the best UK second hand classified and auction sites in one place. This has a stainless steel top on galvanized steel legs. Due to being stored outside it has a few marks on it which can be polished off. 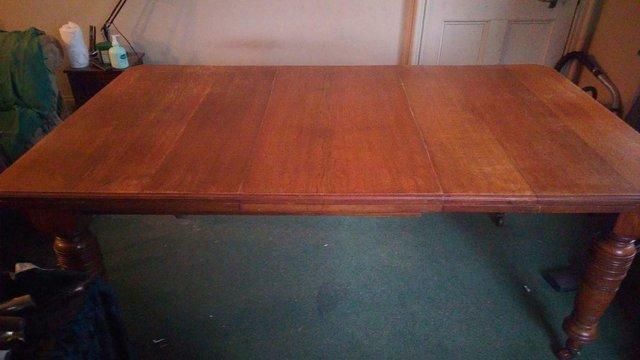 Sturdy kitchen table, solid wood, in excellent condition. Buyer collects from Southport. A real bargain! ITALIAN KITCHEN TABLE-46.5 INCHES (1.18 METERS) DIAMETER. INLAID PATTERNS ON A HIGHLY POLISHED SURFACE.FOUR LEGS ON A CENTRAL BASE GIVING HIGH STABILITY. Stunning antique quality made oak barley twist gate leg drop leay dining / kitchen table taht is in super condition Fabulous for country home cottage lounge kitchen etc Measures 91 W x 124 L extended. Reluctant sale Gorgeous table and six chairs New kitchen forces sale as its a little big. Metal frame and sea green glass top 5ft by 3ft Metal frame chairs. Buyer to collect, easy dismantle. TABLE CLOTH WHICH IS WIPEABLE, CHLORINE FREE AND FOOD SAFE. TABLE CLOTH IS NEW AND STILL IN PACKAGING. Solid Wooden Extending Kitchen Table And two Chairs. In good Used Condition. Table measures 90 cm long 50cm wide (89 cm ) when extended 74 cm high. From a pet and smoke free home. small kitchen table and 2 chairs. Condition is Used. Collection in person only. Photos and measurement to follow Really heavy and solid mahogany square table, has some scratches but would look really good painted up Only selling as moving home and have enough tables! Granite and oak kitchen table. Immaculate condition. Rustic unvarnished table. Seats up to 8 Please note the base does not come apart. Delivery can be arranged in 10 mile radius for petrol money. Kitchen Table And 4 Chairs- farmhouse style. kitchen table and chairs. 90cm w,70cm d, 76cm h. Condition is Used. Collection in person only. Black John Lewis table and two chairs. Table has a granite top so it?s quite heavy! Very good condition. A very useful ironing board - table top variety. Hardly used. In excellent condition. No longer required. Bought whilst on holiday but hardly used! It is 29 inches long x 13 inches wide. This table has a stainless steel top. It has been stored outside so has a few marks on, which can be polished off. The table legs need sanding as they are rusty. Priced to reflect this. White Table plus 2 x White Chairs . Condition is Used. Very Good condition/ looked after. But these are 2nd hand & a few years old so not perfect - tho almost! And rarely used. House move forces sale! Purple table and chairs. Used condition but loads of life left in it. Kitchen / dining table seats 6 with only 2 leaves but 8 if the middle leaf is added. You can see from the photo, that the middle leaf is cleverly stored underneath the table and it easily slides out..
foldable butterfly table, we've had it for 3 years and rarely used it. We are moving house and want to sell it before we move. 4x chairs, ideal for 4 people but you can squeeze 2 more. Retro 1960's Dining/Kitchen Table and 4 Chairs. Condition is Used. Upcycled oak extending table + 4 chairs. Finished in sage green and chalk white. Extends from 56? to 70? Shabby Chic Kitchen Table Bench With Pin Legs. Condition is Used. Collection in person only. Round Folding Kitchen Table And Four Chairs. Condition is Used. Collection in person only. Pine. Suitable for refurbishment project. Wooden Farmhouse Dining Room Table Kitchen Pedestal Round Breakfast. Condition is Used. Collection in person only. only selling as im moving into a furnished house, bought this last year and its in good condition with three chairs. Condition is Used. Collection in person only. 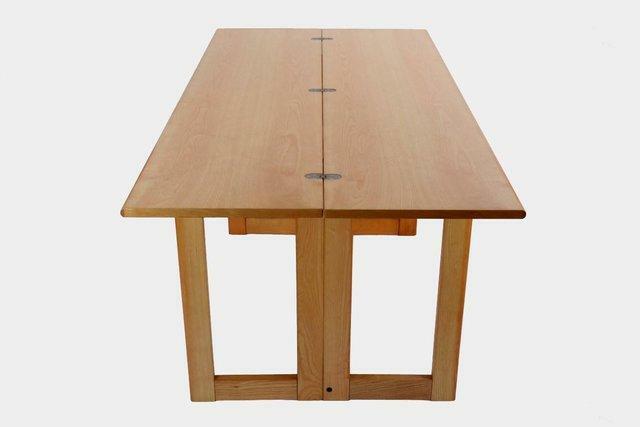 Pine kitchen table, with chunky traditional legs which are easily removable for easy storage. Needs top re-sanding. Ideal piece of solid wood furniture for hand painting. A 6 seater Dining Set comprising a 21mm thick Ash veneer table with 6 brown faux leather chairs with solid Ash legs and stitching detail on the seat backs. Table Dimensions: L1400mm x W850mm x H745mm.